"Scaling"...These day's it's probably in the "buzzword" lexicon but it didn't used to be. It was just another one of the major stages of business (and life for that matter!) growth, evolution, and maturity. The Goal of Scaling any system, be it life or business, is to meet projected or actual growing demand for your product or service by adapting said system to produce to that demand. Whether it's a product or service system or just regular conduct in your life, scaling up your capacity and capabilities will allow you to win in business and life. The paradox of the scaling stage is that the volume of activity and "busy-ness" is so high that it's REALLY hard to scale strategically and with a methodical plan. Perfect world, right? Not so with a few key ideas and actions in mind. To scale ineffectively or inefficiently can spell certain doom or at a minimum stagnation. This also begs the question that your product/service process/system is scalable in the first place but we'll talk about that later. Before I get into it, I wanted to talk about scaling in general. Scaling isn't the same as being more productive. Productivity is most generally about the ratio of inputs to outputs in any given system/process (I'll use process from now on for simplicities sake, there is a difference though). Basically, if you keep outputs the same or constant but decrease the inputs required (labor, raw materials, energy, money, etc.) you're now more productive! Simple as that! Now, scaling is much bigger in breadth and depth. 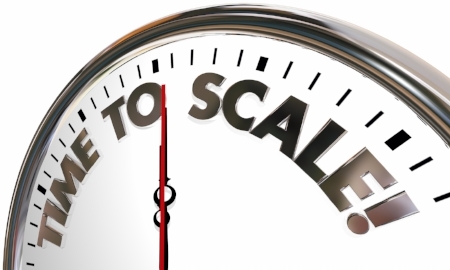 Scaling means you must rapidly expand your capacities and capabilities to meet growing demand for your product or service (or even attention in some cases). This means your outputs must increase rapidly, sometimes even exponentially, and you need to increase inputs in critically important ways to be successful in meeting the new changes in demand with increased outputs. See the difference? This post will be completed in a 3 part series to come out over the next 3 weeks. In all 3 I'll discuss constraints for the goal of scaling, critical analyses and actions to take, hazards to avoid, and peppered throughout will be useful resources I think could benefit my readers. These posts by no means will be 100% comprehensive for this stage in business devleopment, that would take writing a pretty thorough book on the subject (someday maybe), but they'll contain what I think are the essential ingredients for success in this exciting but hazardous transition in life & business. If you need help scaling up, in life or business, please don't hesitate to Contact Me directly. The 3 part series will be: 1) Scaling a business, 2) Scaling Your Life, and 3) Common Ingredients for both. In business, the distinct difference between starting up and scaling is that 1) you have a product or service that now meets or exceed customer requirements and 2) customers are now paying you for that product or service (i.e. you have revenue). There are plenty of nuances to what the identifying markers are for this business transition and even some technical methods for more complex processes but for now, this is the distinction we'll be sticking with. Scaling happens, whether you plan for it or not, when customer demand exceeds your ability to produce to that demand. The "potential demand" can be considered an upper limit to what the needed output is. Finding that figure can be pretty difficult so if you need some in-depth market analyses, please contact me for more help. I'll now get to the key tangible details for scaling your business. Clearly describe your process (or processes) for delivering value (product or service) to your customer. Edward Deming, the father of statistical process analysis, once said "If you can't describe what you're doing as a process, you don't know what you're doing". This is oh so true. I believe you MUST not only describe it verbally, which for most people is relatively easy, but it should be written down, in SOME form to clearly understand the transfer of value through the process. Understand Your Process Capacity - this means the total volume of goods or services you can produce for a given time period or put another way, the maximum amount of work that can be accomplished with a given set of inputs. This somewhat abstract number is THE determining factor in your current production abilities (again, whether a product or a service) and is the number to plan to grow, which leads me to #3. Identify Your Capacity Constraints and Continuously Break & Improve Them - this is straight out of the Goal by Eli Goldratt. Every process has a limiting task or process step that constrains the processes ability to produce faster or to a higher rate. This constraint can be a piece of equipment in the process, physical floor space limiting movement, or something more intangible like information flowing through your process. The idea is to identify them, get everything else tuned to this constraints rate, then break the constraint by adding capacity (or improving the process associated with the constraint) and then repeating the cycle over and over. This is probably one of the KEY missing ideas I see out there for small and large scale manufacturers and service providers. Understand Your Current and Future Capability Requirements - this is about unique capabilities required to produce your product or service and deliver it to the customers who want it. It's quite often an employee skills based things (see my post on Training) but can also be about the fundamental ways your production of value needs to change in the future to be more efficient and effective. You may need to develop a comprehensive training plan, talent acquisition plan, or plan for strategic and systematic purchase of new capabilities for what might be needed in the future. You ought to know what your strengths are, your employees current strengths are, and the business strengths in general so that you can leverage/amplify those and augment the weaknesses in capabilities in other ways. Also, this is where a lot of business owners start to put on a LOT more hats than they really should. Capabilities like general marketing (not skills based like social media or digital design) where you need to grow customer awareness, develop continuous and effective feedback loops for value improvement between your customers and your internal processes, identify new market sizes, etc.. It could also be that you need direct sales expertise as well in this stage. Outsource for a specific period of time - this might seem like a big expense and not worth it but it can get a great deal of quality work done in a short period of time and return much more than your investment if done correctly. Hire internally - this most often happens when you're certain you can afford in-house capabilities like a Marketing and Sales Manager, Operations Manager, etc. General Management Capabilities - I see this in a lot of cases where hiring a supervisor or manager is seen as a waste of money and/or unwarranted. However, with a skilled and flexible manager/supervisor, an owner can maintain a longer term, strategic view of the business and focus more on working ON the business rather than IN the business so much. Continuously Plan and Adapt as You Scale - this stage of business development is hazardous for many reasons that require you as a business owner to address on a continuous basis. Planning can be done in small, tangible, and highly controlled "chunks" such as using the Agile Project Management approach while blending longer term views of the business and market with a longer term plan. Some capacity/capabilities take time to nurture, grow, or purchase so you'll need near AND long term planning to stay ahead and be effective and efficient in your scaling. Funding Scaling Primarily with Sales Revenues - some businesses rely much too heavily on scaling by using customer revenues directly. This is quite tempting and can be done but often takes much longer than other means of funding. I'm not saying partially funding scaling with revenues is a bad thing but relying on it will induce a lot of hardship. This is due to erratic and fluctuating demand = erratic revenues, much harder to plan effectively, hard to take into account planned process disruptions for training, retooling, facilities moves, delayed payments on contracts, etc.. Obvious other sources of funding are investors or debt based leveraging. These have their own challenges (if it were easy, everyone would be doing it!) but a thorough trade off analysis can help to select the right funding sources to scale with the best odds of success with lowest downside risks. Scaling Your Operation More Rapidly Than Demand - as you scale, you'll need to ensure you have the customer demand and revenue to pay the increasing variable costs associated with the scaling. You'll need to do things as mentioned above like get the right marketing & sales support, supervisors, maintenance, etc. to lift the whole system up to meet the demand. Many startups and new businesses get REALLY energized by getting funding and making purchases to setup the business without having the right plan in place to steadily grow demand ahead of the costs of doing business. Hiring too many people for your demand or cash flow is some of the biggest hardship I see with business owners, no one likes to be the hand that is hiring and laying off good employees because of imbalances in production and demand. Ad Hoc Scaling - I see a lot of burnout happen here from small business owners all the way to Aerospace manufacturing. Some scaling is conducted almost completely ad hoc while other times it is done with improper planning methods. I really hate to see burnout happen, for ANY reason, but feeling customer demands from one side and the challenges with process scaling on the other can become unbearable for almost anyone. Plan ahead, seek Operations help, or Contact Me directly if you need help! Scaling a business is hard, multi-dimensional, and takes a lot to plan for and execute effectively. Many businesses get into the scaling stage only to hit many (and others) of the hazards I've spoken about here. I hope this post has at least provided my readers with some awareness of where to look and how to do some of the scaling in a systematic and strategic way. For inspiring stories about scaling but not focusing on growth alone, a fantastic book by Bo Burlingham is Small Giants: Companies That Choose to Be Great Instead of Big. For more technical but approachable reading look at Factory Physics for Managers.